I had such high hopes for these after seeing the recipe on Annie's Eats. After all, she got them off of the Martha Stewart website (for pumpkin-chocolate chip squares). I love the spiciness and flavor of pumpkin bread, so I thought these would be even better. They weren't. I can't believe I could be so disappointed with a Martha Stewart recipe, but I was. They come out more cakelike than blondie-like (which are more dense) and the flavor just wasn't there. I could barely taste the pumpkin, let alone the spices. The only good part about the whole thing was the butterscotch chips I put in them. Without those, they really would be too bland. I'm not sure exactly what the problem is. Maybe swapping out the white sugar for brown sugar would give it a deeper flavor, that and doubling the amount of spices. I don't know. But, I think I'll stick with my own pumpkin bread recipe from now on. That's always a sure-fire pleaser. Grease a 9x13 pan. Combine dry ingredients. Cream butter and sugar and add the egg and vanilla. Add the pumpkin. Add dry ingredients and stir in the chips. Pour into pan and bake 35-40 min. Sift all dry ingredients together. Cream butter and sugar and add the eggs. Add the pumpkin. Add flour mixture. Bake in two large loaf pans for 1 hour and 15 min. at 325F. Update 3/27 - I took these to my ward's Munch n' Mingle today and there wasn't a single one left! So, it seems that I may have been a little too critical of them, since other people really enjoyed them. Oh, and chilling them in the fridge really helps to make them more dense like blondies should be. You can never go wrong with plain old Rice Krispie treats. But, I'm always on the lookout for a new twist to put on them. 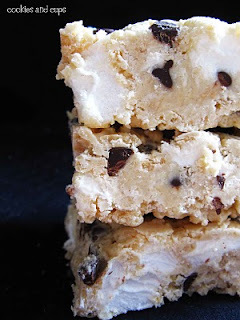 When I saw this recipe for Avalanche Bars on Cookies and Cups, I thought, this is it! Not to mention, I had a bag of white chocolate chips that I needed to use up. The recipe came together very easily. The only change I made was using M&Ms instead of the chocolate chips since that's what I had on hand. They added a nice pop of color to the bars. The thing to remember, though, is that the consistency of these bars will be more candy bar like rather than chewy and gooey since the cereal is held together by the melted chocolate rather than melted marshmallows. Kind of reminds me of those white chocolate-pretzel-Rice Krispie combos that people used to make during Christmastime. Hmmm, speaking of which, pretzels might actually be a neat addition to these bars. It'll give it that little bit of saltiness to counteract the sweetness. But, I digress. As for the taste of the bars themselves, I just wasn't won over by the white chocolate-peanut butter flavor. It wasn't bad, but it was a little sweet for me, so I'm not sure that I would make these again. That said, I do think that other people would enjoy them. To cater to my own tastes, I would probably use dark chocolate chips and butter instead of white chocolate chips and peanut butter, omit the marshmallows and chocolate chips, and add chopped pretzels and peanuts. Then, I'd top the whole thing off with a peanut butter drizzle. YUM!!! I can see it now . . . . . . Melt the white chocolate chips in a double boiler. Add the peanut butter. Add the Rice Krispies. Let the mixture cool 15-20 min (if your Rice Krispies came from the fridge, it'll cool down a lot faster). Add the mini marshmallows and chocolate chips. Press into a greased 8x8 pan and top with more chocolate chips, if desired. Chill in the fridge until set. Okay, I may be all baked out, but I'm not all cooked out. After all, man cannot live on cookies and cake alone. I needed some real food, okay, healthy food to counteract the sweets that are now calling me from the kitchen. So, I made up a big pot of potato soup. It actually came out pretty good and it's something that I would make again. Of course, I'm sure it's not as good as the "real" thing made with cream or made all of milk instead of my watered down version. 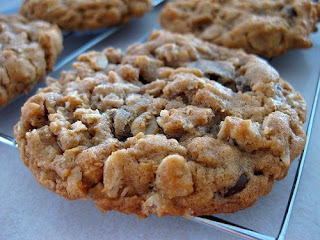 But, I have to cut corners somewhere, especially if I intend to chase the bowl of soup with one of my cookies or bars. Saute the onion until soft. Add the chicken broth and milk. Add the potatoes, salt, pepper, and seasonings and simmer until potatoes are soft. Add the potato flakes to reach your desired thickness. If desired, instead of the dill or garlic powder, curry power works well too. Okay, so these aren't really s'mores bars since there's no graham crackers anywhere in the recipe. But, it's what my family has always called them and old habits die hard. However, as Shakespeare once put it, "What's in a name?" That which is sometimes called a Deluxe Chocolate Marshmallow Bar by any other name would taste as sweet, which is exactly what these are. 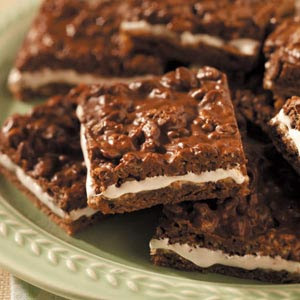 They are chocolatey, they are gooey, they are crispy - they're like a candy bar on top of cake. In a word, they are amazing and you MUST make these. I hadn't made them in years, but there was a cookie contest at my ward that I wanted to enter and if I intended to win, this was no time for any mere chocolate chip cookie. No, I needed to pull out the big guns. Hence, I made these. One bite of them and I was transported back to my childhood. It's definitely one of my faves and worth making again and again, especially since it's so easy to put together and doesn't require making anything from scratch. Unfortunately, although they were delicious (dare I say out-of-this world good), and a lot of people enjoyed them, they did not win the cookie contest. Oh boo. Well, that's the way the cookie crumbles. I'll just have to find something even better for next time (though, really, how do you top chocolate, peanut butter, and marshmallows). Oh well, I guess you'll just have to make this recipe and judge for yourself. They may not have won the contest, but they'll definitely win over your tastebuds. Make the cake as directed on the box and divide the batter into two 9x13 pans. Bake at 350F for 15 min. Spread the mini marshmallows evenly over the cake and bake for 3 min. more or until nicely melted, but not browned. Carefully spread the chocolate mixture onto the marshmallow layer. (it's easier if you sort of dollop it on and spread it with your fingers) Chill for several hours or overnight in the fridge until the chocolate layer is set. Cut into bars and enjoy. 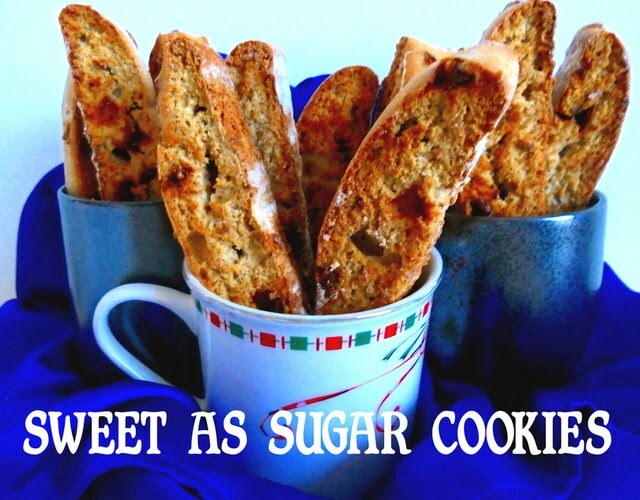 I saw this recipe on Tracey's Culinary Adventures several days ago. They looked absolutely delicious and seemed so quick and easy to make. Little mounds of fudgy goodness. I knew I had to make them. And make them I did this morning. The only substitution I made was using fat-free sour cream instead of yogurt. I ended up scaling back the recipe to four-fifths. Now, why would I do such a ridiculous thing? Because I found that I only had 8 tablespoons of cocoa powder instead of ten. Well, I wasn't going to let a little thing like that deter me from making this recipe. So, using my awesome math skills, I re-calculated the amounts. Okay, fine, maybe they weren't so awesome after all because I ended up adding the full cup of flour instead of the scaled-back amount. Oh well, to err is human. Lucky for me, that didn't seem to affect the cookies any. In fact, eating the dough alone (totally fine since there's no eggs in this recipe) was heavenly, but *sigh* they DID have to be baked. The result was everything I could have hoped for. 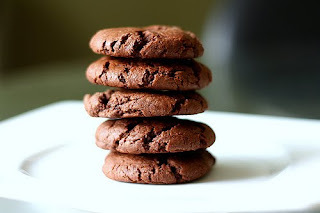 They were chocolatey, they were chewy, they were perfect. I'm already contemplating playing around with this recipe in the future - perhaps a white chocolate peanut butter drizzle to finish them off, or adding cinnamon or chipotle chili powder to the mix, or even rolling them in a combination of sugar and chai spices. I can just see it now. Ohhh, yes, this is a go-to recipe from now on. Melt the butter in a saucepan over medium heat. Once melted and sizzling, remove from heat and whisk in cocoa until smooth (it will look like a chocolate paste). Add both sugars and stir until blended - the mixture will be stiff and sandy at this point. Add the yogurt/sour cream and vanilla. Add dry ingredients and stir gently until just combined. Drop rounded tablespoonfuls of dough onto a baking sheet. Bake until the cookies look dry on top and are cracked all over, but are still slightly soft when pressed, about 10-12 min. So, I finally got around to trying this recipe that's been so highly rated by lots of people who made them. I had high hopes for this recipe. I mean, really, chocolate AND peanut butter AND oatmeal, how could you go wrong? Well, the cookies unfortunately did not blow me away. It just tasted like a good oatmeal chocolate chip cookie. I could faintly taste the peanut butter, but I would have liked it to be more up front and center. I suppose I could always substitute peanut butter chips for the chocolate chips and then drizzle the whole thing with melted chocolate. Now, THAT would be a COOKIE!!! But, who knows, maybe if I wait for the cookies to cool a little more, the flavor will become more pronounced. I'll just have to wait and see. However, regardless, I am still posting the recipe for posterity's sake. Combine the oats, flour, baking soda, spices, and salt. Cream the butter, peanut butter, and sugars. Add the eggs and vanilla. Add the dry ingredients, then fold in the chocolate chips. Drop by tablespoonfuls onto a baking sheet. (they will spread, I promise) Bake 13-15 min. (they will still be slightly soft in the middle). They'll firm as they cool. It's just been one school deadline after another. Really, where does the time go? As a result, I haven't had a chance to bake anything for weeks and I was starting to go into baking withdrawal. This weekend was no exception since I had a paper I was working on. That meant that I couldn't bake a batch of cookies, which is my personal preference (not to mention there are sooooo many amazing recipes I'm dying to try - Apple Cinnamon Oatmeal Butterscotch Cookies, Chunky Oatmeal Peanut Butter Chocolate Chipsters, and Comfort and Joy Spice Cookies, to name a few). However, I was still determined to bake something, anything. Thus, the idea for Irish Soda Bread was born. What with St. Patrick's Day coming up, it's been on my mind. It's such a quick and easy recipe and I've always wanted to try making my own. Somehow or other I've just never gotten around to it, until now. So, after spending my customary hour in the gym (I had to burn off the future calories I would consume while eating my fresh bread), I got into my kitchen, whipped up the dough, and got it into the oven to bake in less than 15 minutes (yes it really IS that quick). In half an hour, I had a crusty, crackly loaf fresh from the oven. It was good, but not quite what I was expecting. Next time I make it, and there WILL be a next time, I'll probably try adding more sugar to sweeten the deal. But, until that time, I guess I'll just have to satisfy myself eating this loaf (ahhh, the sacrifices I make for my craft). Combine the dry ingredients. Add the buttermilk until the dough comes together. Form into a disk on a floured baking sheet and flatten to about 1 1/2 inch thickness. Using a serrated knife, cut an "X" shape in the top of the loaf. Bake at 375F for 30 min. until the loaf is brown and sounds hollow when you tap the bottom. Eat plain or with butter and jam.